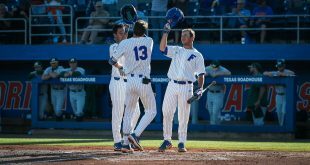 The Florida baseball team was not able to open its first SEC home series the way they had intended. The number four ranked Arkansas Razorbacks came away with the first W of the series, with a 6-3 win in Gainesville. The Gators couldn’t manage to get their bats going against Arkansas pitching. Brady Singer started on the mound for Florida and threw seven innings in taking the loss. He gave up seven hits while walking two and fanning seven. Arkansas got momentum quickly in the second inning. With two on, freshman Heston Kjerstad drove in a run with a double and with runners on second and third Carson Shaddy hit one back toward Singer and the ball hit off his leg as two runs scored to make it 3-0 Razorbacks. Arkansas starting pitcher Blaine Knight had a strong showing against Gators. He came out of the game in the middle of the sixth inning, giving up five hits, with four walks and 10 strikeouts. Gator coach Kevin O’Sullivan said one thing that hurt the team early was having the bases load the bases in the second and not being able to bring anyone home. 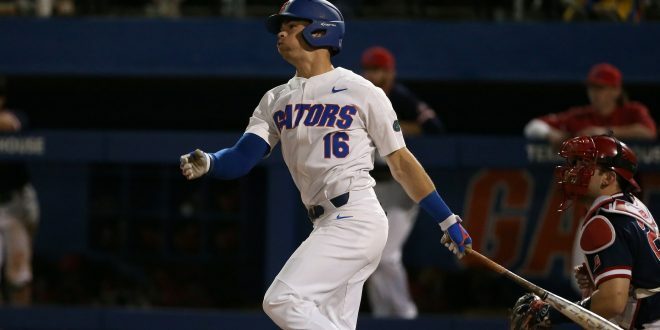 The Gator were only able to score on Knight during the fourth inning when Deacon Liput hit a homer to right center that also scored Jonathan India. Despite being able see the ball well enough to hit a homer, Liput emphasized after the game how Knight was nailing his off-speed pitches. The first #LiputLongball of the season! A 2-run shot to RF gets the #Gators on the board. While Liput hit his first homer of the season Wil Dalton also hit one out for his 10th home run of the season. O’Sullivan mentioned that because of Dalton’s home run ability, they might move him down in the order from his lead off spot so he could drive in more runs. Liput also said he’s very impressed by Dalton’s ability to drive the ball. Arkansas baseball is second in the nation in total home runs this year with an astonishing 43 this season. Dominic Fletcher sent one over the fence in the fourth inning and Kjerstad also went deep in the sixth inning as well. 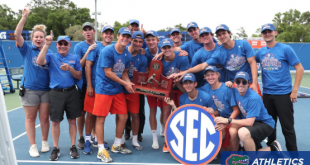 The Gators will be facing the Razorbacks at noon on both Saturday and Sunday at the Mac.